Add an elegant award for your next tournament that is sure to be proudly displayed on the desktop or bookshelf! It's a solid black marble paperweight! 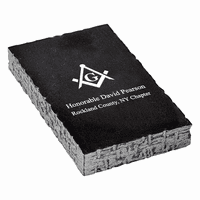 The 3" x 5" rectangle features a laser-engraved Golf Ball emblem on the polished top surface, with room for up to 6 lines of personalized laser-engraved inscription, available at no extra charge. It comes packaged in a handsome gift box, ready for presentation to participants or champions after the game!